Bleacher Report Live (B/R Live) is a US based sports streaming service offering sports, offering live streaming of premium sporting events. B/R Live offers users month-to-month subscriptions on a per-sport basis, as well as pay-per-view options on a single event/game basis. For Soccer viewers, BR/Live offers both a monthly and annual subscription rate as well as per-match rates. Free streaming for select events is also made available on a select basis. Regular users can get a 5-minute free preview for all events streaming on B/R Live. 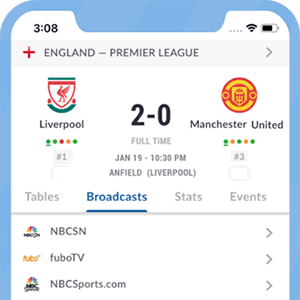 BR/Live is available on multiple platforms and devices including Online (web browser), on connected devices such as the Roku, Apple TV and Amazon Fire TV as well as on mobile apps on iOS and Android devices. BR/Live viewers can watch replays on-demand of every match originally aired live on B/R Live. Beyond Soccer, B/R Live will also offer other premium sports streaming including NBA, NCAA, PGA coverage and others. B/R Live is the US streaming destination to watch some of the premium soccer competitions such as the coveted UEFA Champions League and the Europa League. See below a list of the broadcast rights that B/R Live has acquired in the USA. *Got itLive Soccer TV does not provide Bleacher Report Live live streaming. The information provided on this page is simply Bleacher Report Live soccer TV schedule. All 12 games will be streamed on B/R Live.